The 66 custom homes comprising this development consist of both one and two level single family residences. 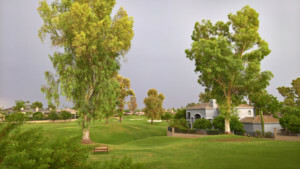 They enjoy their own separate gated community within the gated Gainey development. The homes range in size from 2960 to 5350 square feet. HOA fees are $505 per month. Prices from around $800,000. Be sure to check out the newly renovated community pool area . . . amazing!